UPDATE: Both of these paintings had successful sales at the Santa Fe Art Auction! Congratulations to the new owner, who is an avid Hulings collector and sure to give these paintings a wonderful new home. Clark Hulings loved donkeys. Just as they are cornerstones of labor in traditional ways of life, they are fundamental and recurring characters in his work. These two paintings were created eleven years apart, and it’s a study in contrasts to look at them together. The painting above, Pepito on Donkey Leading Donkey, is 1969 and set in Mexico. 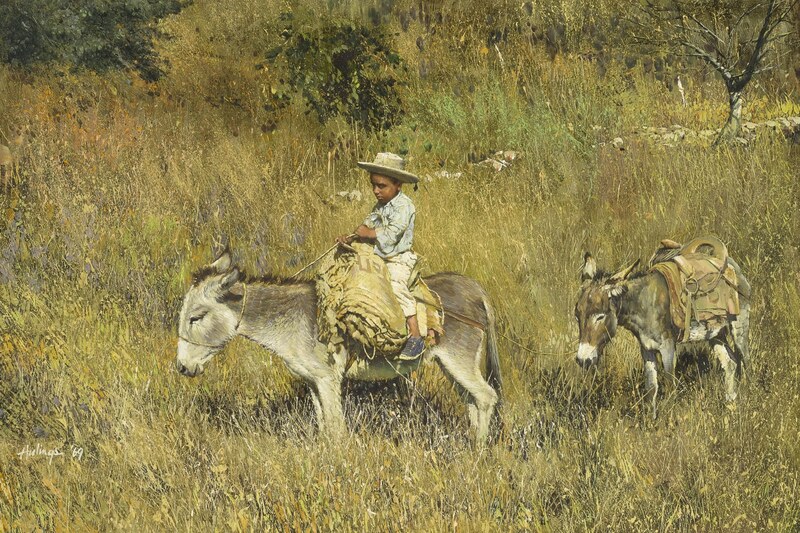 Pepito is a little boy, riding a sable donkey with a saddle blanket, leading an even smaller saddled donkey; they are in dry grass and facing left. 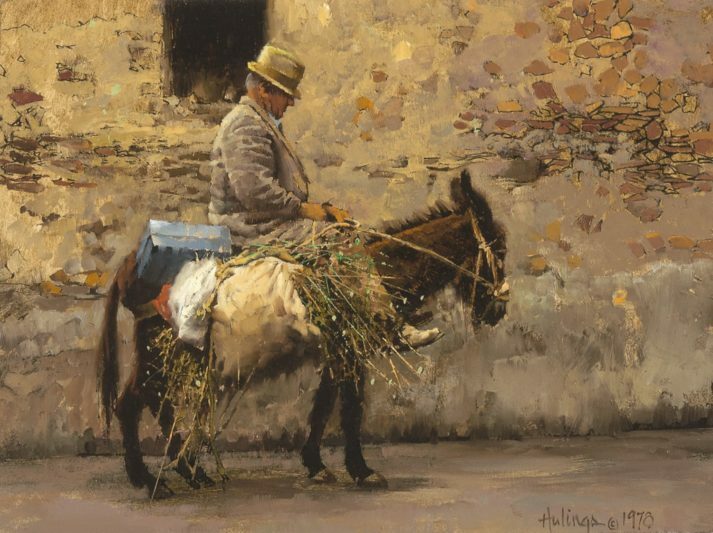 The painting just below, Fodder for the Donkey, Gift for the Wife is 1978 and set in Sicily, Italy, featuring an older man carrying a blue box and some greenery, riding a dark brown donkey in front of a stone building, and facing right. Despite the paintings’ differences, they are similar in that the donkeys are small and gentle-looking; and in that their riders both wear hats and have their gazes cast down in concentration. No matter where in the world and what age you are, there are things to get done. You’ll also see that, although the palettes of both paintings are in earth tones, they each have lively accents. Both have a pop of bright green foliage. Pepito… has red and purple flowers mixed through the grass, some strategic deep green-black plants, a standing tree, and a fallen birch. Fodder…has the signature orange-red accent just under the blue box, a cleverly-placed dark window just off to the side of the man’s head, and a very detailed section of the wall on the right. This is the last of our features on the six Hulings paintings that will be featured this Saturday, November 10th at Santa Fe Art Auction. If you’re interested in saddling up and bringing a few donkeys home to join your art collection drop us a line and we will connect you.